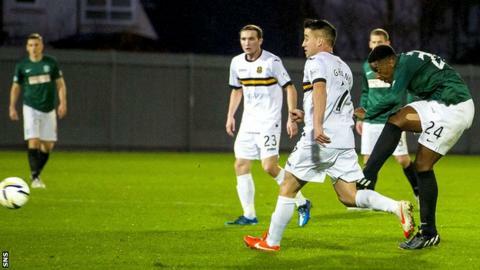 Dominique Malonga hit a hat-trick as Hibs made it five straight away wins with an amazing triumph over Dumbarton. Scott Allan's shot put the visitors ahead, Malonga's strike doubled the advantage soon after and Paul Hanlon slotted home Hibs' third. Chris Kane pulled one back for the Sons and Andy Graham headed in their second before Malonga netted with a fine shot. Garry Fleming gave the hosts fresh hope before Sam Stanton and Malonga completed his hat-trick. Match ends, Dumbarton 3, Hibernian 6. Second Half ends, Dumbarton 3, Hibernian 6. Foul by Christopher Kane (Dumbarton). Substitution, Hibernian. Matthew Kennedy replaces Jason Cummings. Substitution, Hibernian. Alex Harris replaces Scott Allan. Goal! Dumbarton 3, Hibernian 6. Dominique Malonga (Hibernian) right footed shot from the centre of the box to the bottom right corner. Assisted by Jason Cummings. Attempt saved. Scott Agnew (Dumbarton) right footed shot from more than 35 yards is saved in the centre of the goal. Goal! Dumbarton 3, Hibernian 5. Samuel Stanton (Hibernian) left footed shot from the left side of the box to the bottom right corner. Assisted by Liam Craig. Substitution, Dumbarton. Jordan Kirkpatrick replaces Mitchel Megginson. Corner, Hibernian. Conceded by Lee Mair. Attempt blocked. Jason Cummings (Hibernian) left footed shot from outside the box is blocked. Corner, Hibernian. Conceded by Kieran MacDonald. Paul Hanlon (Hibernian) is shown the yellow card. Christopher Kane (Dumbarton) wins a free kick in the attacking half. Attempt blocked. Dominique Malonga (Hibernian) right footed shot from outside the box is blocked. Andy Graham (Dumbarton) is shown the yellow card. Substitution, Hibernian. Samuel Stanton replaces Daniel Handling. Goal! Dumbarton 3, Hibernian 4. Garry Fleming (Dumbarton) left footed shot from outside the box to the bottom left corner. Foul by Mark Gilhaney (Dumbarton). Foul by Colin Nish (Dumbarton). Mitchel Megginson (Dumbarton) wins a free kick on the right wing. Mitchel Megginson (Dumbarton) wins a free kick in the defensive half. Goal! Dumbarton 2, Hibernian 4. Dominique Malonga (Hibernian) right footed shot from outside the box to the top left corner. Assisted by Jason Cummings. Goal! Dumbarton 2, Hibernian 3. Andy Graham (Dumbarton) header from the centre of the box to the top left corner. Assisted by Mark Gilhaney. Scott Agnew (Dumbarton) wins a free kick on the left wing. Chris Turner (Dumbarton) wins a free kick on the right wing. Scott Allan (Hibernian) wins a free kick in the defensive half. Foul by Kieran MacDonald (Dumbarton).